Alciato at Glasgow: Emblem: Strenuorum immortale nomen. Section: HONOR (Renown). View all emblems in this section. Quem plerunque pedes visitat alba Thetis. Quòd nunquam herois sit moriturus honos. Debet Maeonidae, quàm sibi Maeonides. You see the tomb of Aeacus’ descendant on the Rhoetean shore, which white-footed Thetis often visits. This stone is always covered with green amaranth, because the honour due to heroes shall never die. This man was‘the wall of the Greeks’, and the destruction of great Hector, and he owes no more to the Lydian poet than the poet does to him. 1. ‘Aeacus’ descendant’, i.e. Achilles, the greatest warrior on the Greek side in the Trojan War. Rhoeteum was a promontory on the Trojan coast (though normally associated with the tomb of Ajax). 2. 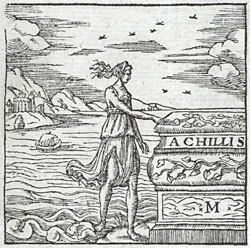 Thetis, a sea-nymph, mother of Achilles, called ‘silver-footed’ by Homer. 3. amarantho: the name of the plant means ‘never-fading’. See Pliny, Natural History, 21.23.47. 4. ‘the wall of the Greeks’, translating Homer’s description of Achilles at Iliad, 3.229. 5. Maeonidae, ‘to the Lydian poet’, i.e. Homer, who told in the Iliad the famous story of Achilles’ wrath and refusal to fight during the Trojan War, and of his eventual slaying of Hector, the chief warrior on the Trojan side. (For which see Emblem 153, [A50a153]). For the sentiment that great deeds need to be sung in order not to be forgotten, see Horace, Odes, 4.8.20ff; and that great literature needs great themes, see Tacitus, Dialogus de oratoribus, 37. Emblematum libellus (1546), Venice: Strenuorum immortale nomen. Los Emblemas (1549), Lyon: Que el nombre de los diestros es immortal. Emblemes (1549), Lyons: Le nom des preux, est immortel. Emblemata (1551), Lyon: Strenuorum immortale nomen. Diverse imprese (1551), Lyon: Chel nome de valorosi è immortale. Emblematum libri II (Stockhamer) (1556), Lyon: Strenuorum immortalenomen. Toutes les emblemes (1558), Lyon: Le nom des preux, est immortel. Liber emblematum ... Kunstbuch (1567), Franckfurt am Main: Strenuorum immortale nomen. Der dapffern starcken Helden Nam ist unzergenglich. Emblemata / Les emblemes (1584), Paris: Strenuorum immortale nomen. Le nom des vaillans hommes ne meurt jamais. Emblemata (1591), Leiden: Strenuorum immortale nomen. Declaracion magistral sobre las Emblemas de Andres Alciato (1615), Najera: STRENUORUM IMMORTALE nomen. Les emblemes (1615), Geneva/Cologny: La renommee des preux est immortelle. Emblemata (1621), Padua: Strenuorum immortale nomen.